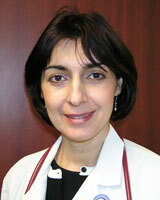 Dr. Leila Vizirov received her medical degree from Azerbaijan Medical University in Baku, Azerbaijan. She completed her general surgery residency training at Baylor College of Medicine in Houston and family medicine residency at Brazos Family Medicine Residency at Texas A&M Health Science Center College of Medicine. Board certified in family medicine, Dr. Vizirov has been in practice since 1981. She provides a full range of primary care medical services, including physical exams, immunizations, pediatrics and women's health. She has clinical interest in weight loss, anti-aging treatments, minor surgical procedures, and aesthetic procedures including Botox, chemical peels and microdermabrasion. Dr. Vizirov is passionate about medicine and helping people. Her patients appreciate her understanding demeanor, the relaxed atmosphere of her office and the ample time she gives them to address their concerns. Dr. Vizirov speaks Russian.